So glad to find your site, fast delivery, great product! Very good instructions especially the videos that take you through step by step, easy to follow and informative. The part I was most nervous about was centering the coil (don't be if you are) but after following the videos it all came together perfectly. My Infinity speakers are now as new and sound great. I highly recommend Simply Speakers! Great product, so glad I found your site. Very straight forward instructions and simple to do. Speakers turned out like new. Thanks again! Kit worked great. Saved my 15 year old speakers. Easy repair, great product, terrific videos for a first timer like myself. Just what I needed. Easy to follow instructions. Simple self repair!???? Very easy and cheap repair. Use a moderate amount of glue, allow to tack and apply. My Infinity's thump like new. Great product, thanks. I absolutely love the foam ring repair kit. It saved me hundreds of dollars. It was fairly simple to install and now my infinity speakers sound brand new again. I highly recommend Simply Speakers! Product worked as described. Fast shipping. The new foam surrounds were perfect. The infinity repair is a little tricky as the foam to speaker glue surface is on the back side of the cone. They sound great now. Q: is this the right foam repair for the infinity kappa 6 woofers? A: Yes, the INF-FSK-10A is correct for Infinity Kappa 6. Q: I measured the speaker and it appears to be a 9 inch the speaker model is SM115 is the FSK-10A The right one ? A: Yes! The INF-FSK-10A is the correct speaker repair kit for the Infinity SM-115. A: Yes, this is the correct kit for the Infinity SM 115 speaker system. Q: Does the foam effect sound quality of my Infinity SM 112 speakers? A: Yes. If the foam is bad, the woofer may sound raspy and distorted. Replacing the foam will repair that issue. Q: Hi, in regards to the option of the foam guard liquid sealer, what do I use this for? And do I need it to do the job? Thanks. A: The sealer is a brush on PVA treatment that is used to extend the life of the foam. It is not required to perform the repair, but is a nice addition. Q: Which foam kit do I need for the monitor 100? 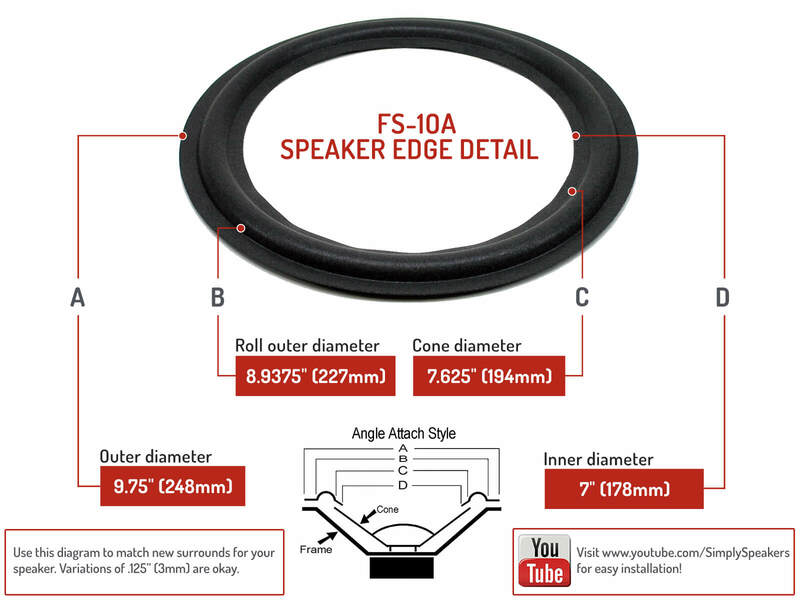 A: Please order woofer repair kit # INF-FSK-10A for the SM-100 speaker system. Q: I've got Infinity RS10 bookshelf speakers. They are about 13.5" tall x 8.5" wide x 8.5" deep. Woofers are about 6" in diam. How do I know if this is the correct kit since you have several advertised? 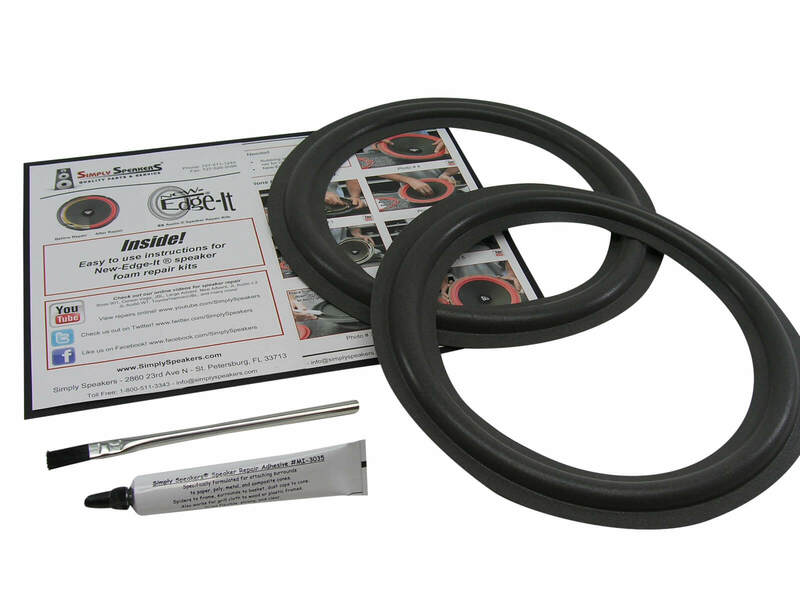 A: The Infinity model RS10 uses our 6.5" kit part # INF-FSK-6.5. A: This kit will repair two speakers. Thanks! Q: Do you measure the speaker cone only or the outside deminsion of where the foam covered? A: Measurement is taken on the overall diameter of the woofer frame. See our FAQ page if you need more information. Q: You have several 10" kits. How can I tell which one I need? We have a pair of Reference Studio Monitors. Can you reply with the correct 10" foam kit as well as the correct full kit for this model. A: Your model uses our foam edge kit part # INF-FSK-10A. There is a "fits models" tab on each product page which shows the applicable speaker models related to each particular repair kit. The only option is the foam edge kit, they do not make a full recone kit for your model. Infinity: 902-0032, 902-2673, 902-2864, 902-3061, 902-3067, 902-4208, 902-4292S, 902-4599, 902-4699, 902-5320, 902-5861, 902-6693, 902-6716, 902-6779, CS-3008, CS3008, CS-3009, CS3009, EL-30, EL30, ES-103, ES103, ES-300, ES300, Infinitesimal IV Subwoofer, Kappa 6, Kappa 7.1, QA, QB, REF 5, Reference Five, Reference Six, Renaissance 90 Series, RS10 Subwoofer, RS-5000, RS5000, RS-5B, RS5B, RS-6 Kappa, RS6 Kappa, RS-6000, RS6000, RS-6000A, RS-6000A, RS-8, RS8, SM-10, SM10, (71985, SM-10-1), SM 10GCF, SM-100, SM100, SM-102, SM102, SM-105, SM105, SM-110, SM110, SM-112, SM112, SM-115, SM115, SM-102, SM102, SM-215, SM215, SSW-10, SSW10, SSW-210, SSW210, 71985, 71985, 72664, and many more!